As the healthcare needs of our nation’s aging population continue to increase, many professions in the healthcare industry are growing rapidly to meet the demand. Current national trends indicate that employment opportunities for radiologic technologists are likely to expand by 12% in only 10 years – just one of many reasons why now is a better time than ever to start pursuing a career in radiology. The state of Mississippi is currently following this national trend with 2,130 working radiological technologists so far, and many more expected within the decade. The mean annual salary for a radiologic technologist in the state of Mississippi is currently $47,930, with a mean hourly wage of $23.04, which is significantly less than the national annual salary mean of $60,320. While this makes Mississippi one of the nation’s lowest-paying states for radiological technologists, it also has one of the nation’s lowest overall costs of living. Even radiological technologists working in the state’s cities enjoy relatively low expenses when compared to other urban areas in the country. More information on Rad Tech salaries in Mississippi. In the state of Mississippi, radiological technologists are required to carry a license in order to perform work. Depending on the specific radiology field, working professionals must renew their licenses every 1 or 2 years. For its licensing requirements, Mississippi, like 36 other US states, uses the American Registry of Radiologic Technologists (ARRT) certification exam. In addition, some radiology fields require workers to fulfill continuing education hours every license term. Mississippi is currently home to 10 radiological technology school programs that are endorsed by the Joint Review Committee on Education in Radiologic Technology (JRCERT) which include 2-year, 4-year and both public and private institutions. Degrees offered include Associate, Bachelor and Masters. University of Mississippi: Located in the capital city of Jackson, the University of Mississippi offers students a Bachelor of Science through its Radiology Department. The program takes 22 months to complete and involves an in-depth residency program and numerous radiology divisions. The program only accepts 50 students per term, and a rigorous admissions process is required of all interested students. Northwest Mississippi Community College: Located in Senatobia, this public 2-year institution does not offer a radiologic technology program, but it does offer a pre-radiology program for students who wish to pursue their MD in radiology at another institution. Mississippi shares its borders with Alabama, Arkansas, Louisiana and Tennessee. Mississippi’s future radiographers can also look for training in: Birmingham, Dothan, Gadsden, Hanceville, Huntsville, Mobile, Montgomery, Opelika and Tuscaloosa, Alabama; in El Dorado, Fayetteville, Ft. Smith, Harrison, Jonesboro, Little Rock, or Pine Bluff, Arkansas; Alexandria, Baton Rouge, Eunice, Hammond, Lafayette, Lake Charles, Monroe, New Orleans and Shreveport in Louisiana, and; Clarksville, Memphis, Chattanooga, Columbia, Elizabethton, Nashville, Jackson, Cookeville, Oak Ridge, Knoxville, and Gallatin, Tennessee. Students should note that community colleges and state universities typically charge higher tuition fees for out-of-state (and sometimes out-of-district) students. There are several large healthcare centers located in Mississippi, especially in the state’s cities and metro areas, which consistently employ radiologic technologists. 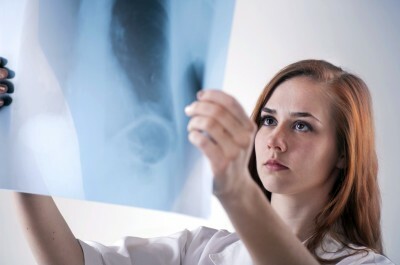 While the largest numbers of radiologic technology professionals work for the major hospitals, small clinics and rural doctors’ offices hire technologists as well. For more information, professional networking and job opportunities, radiologic technologists in the state of Mississippi should consider joining the Mississippi Society of Radiologic Technologists (MSRT), which is a professional organization that was established back in 1938. Prospective students of radiological technology should also visit the Joint Review Committee on Education in Radiologic Technology (JRCERT).